It’s been a while since I’ve shared a few of my favorite things with you, and since you may be in the mood for a few new things for fall, maybe you’d like a little design candy to give you someinspiration! 1. First is this adorable, fabulous, colorful case for the iPhone 6 or 6s (anyone just get the upgrade?). It’s an awesome deal on Amazon right now, too! Click here to snag one of these beauties. 2. As a cake stand collector, I fell in love right away the minute I spotted this beauty at H&M home! Perfect for every season, really, but can’t you just see a beautiful pumpkin cake sitting pretty up there? Get yours here before they’re gone! 3. And another great find from H&M– this green velvet pillow cover. It’s the best deal in town and looks suspiciously similar to a very pricey version from one of my favorite decor catalogs. Find it here in this great color and several others! 4. Ahh, this! The Complete Book of Chalk Lettering by Valerie McKeehan. I just received mine and it is awesome! I get so many questions about my chalk art…whether I use real chalk (yes! )…whether I use stencils (no)… if you have to have good handwriting to do this (no), and I’ve found in reading this book that Valerie answers all these questions and many more. If you’ve dreamed of becoming better at chalk art, this is a must-read! I can’t wait to improve my own art with these tips! Buy it for a great deal here on Amazon! 5. And if for no other reason than the fact that Joanna Gaines wears boots like these, I had to get some for myself. I found a great pair at Marshalls, but I spotted these Clarks for a good price on Amazon as well! 6. And what’s fall without a plaid throw? I couldn’t resist the colors in this new one from Ballard, so I splurged a little and I’m loving it. It also goes great with the green H&M pillows! 7. Time for coffee? Of course! Especially on these cool fall mornings. Kate Spade is always on my list of favorites and this cute mug is a keeper. Find it here. 8. And last, but never least– the super-popular oversized plaid blanket scarf. You can find it several places, but this Etsy seller is having a special on them right now. Now bring on the cooler weather so I can try this thing out! Hope these favorites of mine inspire you for the fall season! What are some of your favorites you’ve spotted recently? **Please note: Some of these links are affiliate links and help to support this blog! Thanks so much! This entry was posted in Uncategorized and tagged Fall, Great Deals, My Style. Bookmark the permalink. Follow any comments here with the RSS feed for this post. Post a comment or leave a trackback: Trackback URL. « Another 5-Minute Fall Wreath Switch-Up! I had no idea H&M had home stuff, or that you could buy their stuff online now…good to know! 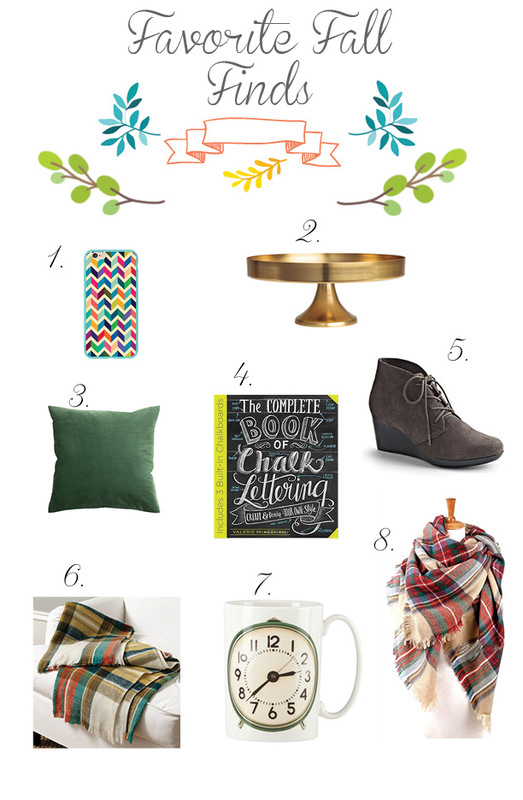 Love these, especially that chalkboard lettering book and the boots. And that's a great deal on a blanket scarf! I knew I loved those boots when I saw you post them…but when you typed that Joanna Gaines wears them, I knew I had to have them! Great picks, Julie–thanks for sharing!